Beaches, Great Lakes lighthouses, and classic American diners. Chicago is an appropriately exciting spot to start your not-boring road trip. From the views atop Sears Tower (I mean... atop Willis Tower) to the hustle and bustle of Navy Pier to the fun to be had at Oak Street Beach (a real sand beach in a Midwestern metropolis!) Chicago is an awesome place to explore before or after a road trip. Kinzie Hotel, Sutton Place, and the Freehand are some of the coolest hotels in Chicago if you need a place to stay, and you can fill up at Gino's East, Al's, and Glazed and Infused before you head out for Cleveland. Only a few miles off the standard highway route, you'll find the sandy Indiana Dunes National Lakeshore... and you might even be able to sneak a meal in at the Southside Soda Shop. Expect this route to add an hour or two to your drive, but those couple hours come with a stunning lake view. Another don't-miss stop is the Studebaker Museum! Most of us at least know that Studebaker used to make cars and now they don’t. What you'll learn here is that Studebaker has made or been a part of making darn near every imaginable thing. A stop at the massive and beautiful 55,000 sq. foot, 3 level museum shows you the massive impact the company (and Packard) had throughout the years from producing multiple presidential carriages to Studebaker military vehicles (Did you know the Hummer H2 & H3 descended from WWII Studebakers?) to the very last Studebaker to roll off the assembly line. The staff is knowledgeable and friendly (but not overly annoying) and you’ll come away with a new appreciation for Studebaker for a very reasonable $8 admission price. While swinging by the Studebaker Museum in South Bend, you also have to make a quick stop at Notre Dame Stadium to throw one up to Touchdown Jesus and do your best Rudy impression. Just a bit further up the road you’ll come across The Hall of Heroes Super Hero Museum, a shrine for all you comic book superhero lovers. The place is fun for all ages, and the owners are friendly. They may even be in costume when you stop by. If RVs are more your thing, stop by the RV & Motorhome Hall of Fame in Elkhart, IN. The RV Hall of Fame features some great vintage campers, and costs $10 a head. It might seem a little pricey, but if you own an RV, love that vintage camper aesthetic, or are considering buying one, it's worth a stop. The South Side Soda Shop in Goshen IN, is one of the best soda shops in the whole country, and features good, classic diner food complete with some of the best pies in Hoosier nation. You may also recognize it from an episode of "Diners, Drive-Ins, & Dives." If you want to celebrate how easy we have it today, stop by Historic Sauder Village, Ohio’s largest living-history village where you can make all the Billy Madison “peeing your pants is cool” jokes you can possibly muster while watching some someone churn butter like it's the 1800s. Just across the Ohio line you’ll come to the hard-working, blue-collar town of Toledo. Swing by the historic Oliver House to sample Maumee Bay Brewing Co.’s beer selection and choose between the higher end steakhouse, the brew pub, the cafe, the lounge, or the sports bar for your food selection. The next diner is not only a classic 1950s aluminum diner, but it’s also attached to the Liberty Aviation Museum, a great hangar-style museum filled with vintage aircraft and military memorabilia, most notably a B-25 bomber. If you have time for a burger at the Tin Goose Diner and a trip the museum, you’re going to leave satisfied. Marblehead Lighthouse is a lot like the Dunes Option, only, as you guessed, it hugs Lake Erie instead of Lake Michigan. Stop for your pretty picture to prove to your friends how much you like the road less traveled. Like the Dunes option, you’ll add just a few extra miles but at least an hour or two to your drive. After the lighthouse, it's not far to your final destination: Cleveland! 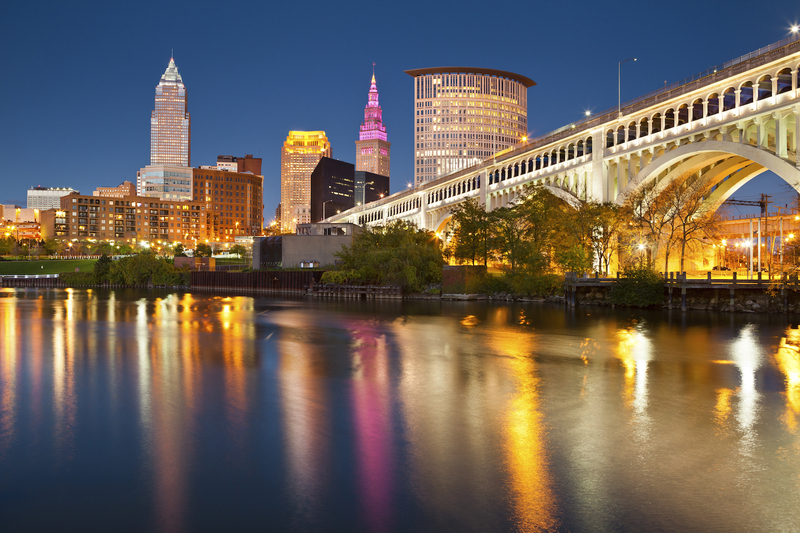 From the Aloft Cleveland to the Metropolitan at The 9, there are loads of great hotels in Cleveland. The city has some cool attractions, too: from the Westside Market to the Rock n Roll Hall of Fame, there's plenty to do here. And if you get hungry, nosh on B Spot Burgers and beer from Great Lakes Brewing! You can either drive along two different Great Lake shores, stopping at the Dunes on Lake Michigan and the Marblehead Lighthouse along the Lake Erie Coastal Trail or you can drive through a cornfield for 5 hours. Choice is yours, but don't be a dummy.. Take the scenic route. Along with the scenery you’ll get a chance to check out some great automotive and military aviation museums and eat some old fashioned American diner food and try some tasty local brews.